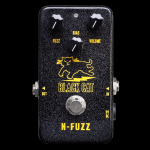 The Black Cat N-Fuzz is another Black Cat legacy product, from the original line created by Fred Bonte. The original N-Fuzz was made in limited numbers between 2001 and 2003, and was only available in the Asian market. The circuit was based on a modified Fuzz Face, with an additional toggle switch for high and low output. According to Fred Bonte, the letter N represented �N-Channel� to describe the type of transistors used. 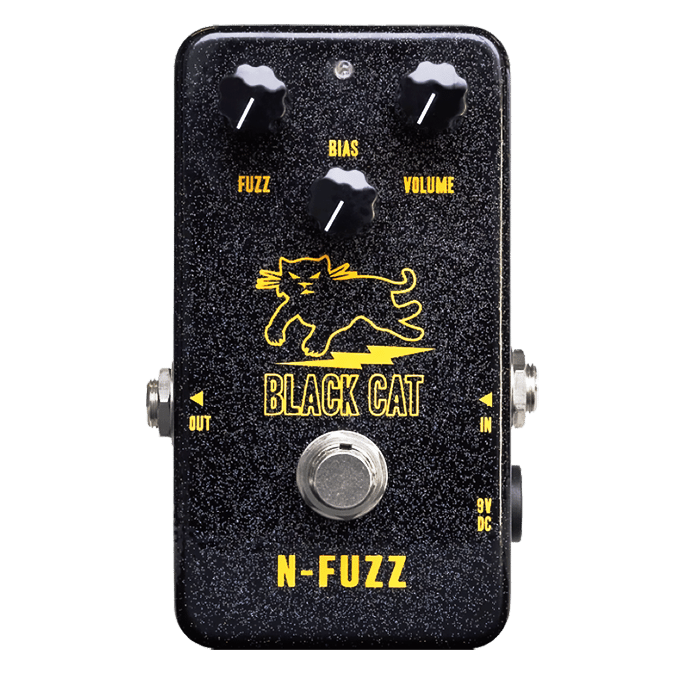 Like the names of most other Black Cat products, �N-Fuzz� was more short and to the point than �N-Channel Fuzz.� Like the original, the new N-Fuzz also uses N-Channel (NPN) transistors. But we felt there was room for improvement with Fred Bonte�s original design. The toggle switch of the original N-Fuzz selected between two fixed bias points, which resulted in one position having a High output, and the other position having a Low output. We replaced the toggle switch with a variable bias control pot. This control makes the new N-Fuzz much more versatile. After discussion with our Japanese distributor about reintroducing the N-Fuzz to the Asian market, we decided to further redesign the N-Fuzz circuit to use Japanese electronic components. This gave a new meaning to the name, which now stands for �Nippon Fuzz.� In selecting transistors, we tried several different types before we found the perfect combination. We eventually decided on Toshiba 2SC1815 for Q1 and Panasonic 2SC1384 for Q2. Much experimentation was also needed to achieve the widest usable range for the Bias control. This allows the N-Fuzz to offer many different tones and timbres of fuzz. Made in the U.S.A.